I don’t believe in coincidences, which sometimes leaves my mental gears spinning, making sense of the odd things that often unfold in life. I know without a doubt there is something I’m missing when a bizarre series of events, unusual and random seeming patterns and algorithms are thrown my way. For this reason a parcel is not always just a parcel, and Frankincense is not always just Frankincense, as you will see below. 2 hours before leaving for Israel, I received an email from the manager of a Frankincense cooperative in Somaliland, inquiring if I had received the package of Frankincense Carterii he had sent. After numerous emails back and forth, it was clear there was no chance I would receive the package in the few minutes before I left. Oh well, it would come when it was meant to come I thought to myself. Nothing I could do about it. Though some of my Ethiopian Frankincense is sourced from farmer/collector collectives and co-ops. This kind of local, sustainable community approach to managing our global resources is still in its infancy. There are only so many odoriferous and medicinal materials that are conscientiously gathered in the wild. Likely very few. Because they are in demand, difficult to cultivate en-masse and often represent only a fraction of a meager yearly subsistence outside of mainstream economics, many wild growing plants and trees are vulnerable to harvesting practices that are detrimental to the plants, and the local ecological balance. Except for rare occasions, wildcrafting in any culture or country is not a well paying job. The harvest and the monetary return fluctuate from year to year, there is often a chain of middlemen who manipulate prices and absorb much of the profit, changing weather and seasonal fluctuations make income unpredictable, and unreliable. There are no benefits, medical or dental, fringe or other, no pension or workers compensation. If you injure yourself, get too sick to harvest, too bad. One tries to make the most of it, when the opportunity presents itself, and nature accommodates the best she can. Cooperative models, on the other hand, can provide landowners, nomadic shepherds, wildcrafters and farmers, individuals and families, incentive and guidance to take responsibility for the plant’s well-being, protect, propagate and nurture them, attend to increasing the population of healthy plants and trees, while preserving the supporting environments in which they grow. Managers eliminate middlemen and represent the interests of the co-op from harvest to consumer. Co-operatives can educate growers and collectors to harvest in ways that maintain healthy plants, long-term growth and optimum yield. The need for this sustainable approach to harvesting from the wild is not limited to Africa, Asia or developing countries, it is an approach that is needed and can work beneficially in developed countries as well. There are very few standards for wildcrafting anywhere in the world. Not even in North America where we see ever-growing lists of plants that are threatened, protected, in decline and near extinction such as Goldenseal, Lady’s Slipper and many other medicinal and aromatic plants. 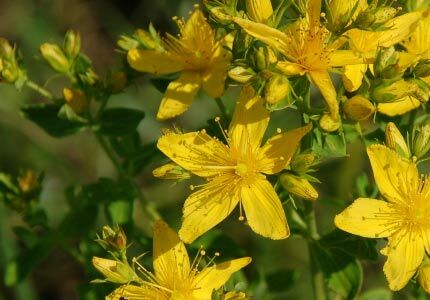 St. John’s Wort. 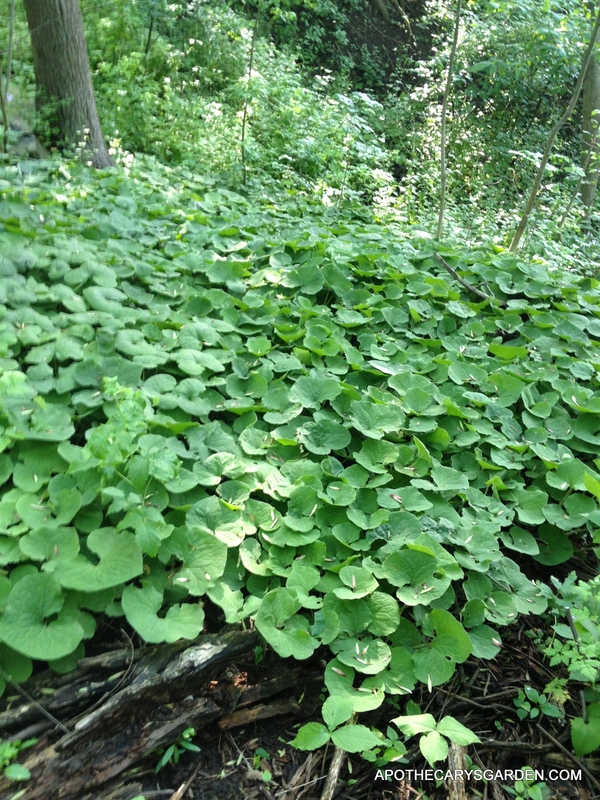 Many thousands of tons are collected from the wild yearly for herbal medicine. Improper and shortsighted harvesting methods have had a great impact on our environment the past 100 years or so, as has the encroachment of roads and cities, invasive species, overuse of herbicides, pesticides, pollution, industrialisation and changes in weather patterns. The saving grace of current wildcrafting practices in North America, is the growing trend of independent, conscientious wildcrafters who have taken it upon themselves to educate and inform themselves and the consumer, while treating nature with reverence and respect. An approach that is slowly spreading in the western world. The increased interest in Herbalism, Naturopathy, traditional Chinese medicine, plant Alchemy, alternative medicine and earth based religions, has given rise to this new kind of self managed ethical wildcrafter whose focus is on quality, sustainability, and the long-term well-being of Nature and the local ecology. I think this is commendable, and a trend that should be encouraged and supported whenever possible. This approach is just as effective as co-ops and other forms of wild harvesting management. This new breed of Wildcrafters embraces an ethical/sustainable harvesting model that leaves a very small footprint on the environment, but unfortunately also often generates a smaller profit margin for the collector’s extra care. Let’s not allow their efforts, care and dedication go unrecognized or unsupported. Educate yourself and seek them out. They do this work on our behalf. It is my hope to generate a list of these small-scale, ethical North American, European and Mediterranean wildcrafters who practice sustainable harvesting methods, on this site for future reference. If you know someone you would like to see on this list, please let me know. The demand for wild medicinal, culinary and aromatic materials is growing steadily, as is the impact of wild harvesting on our global environment. Cooperatives and other managed wildcrafting systems, could, in theory slow down and even reverse the large-scale global ecological mess we are creating. One harvester at a time. The old model of opportunistic harvesting was focused on extracting the greatest amount of plant material, or oleoresin from trees at any cost. In the case of medicinal and aromatic plants, collecting as many as possible in the shortest possible time, so as to increase the ratio of payment to hours of labour. (The profit margin). Care in harvesting is often not high on the list in these scenarios. Collateral damage can only be imagined, especially when mechanized methods such as bulldozers and backhoes are an option. Large tracts of valuable plants can be eliminated from the landscape, leaving nothing behind, and no chance for the landscape to recover for many years if ever. Yes, this does unfortunately still happen! We, as consumers, are largely unaware of what goes on to bring us our wild medicinal and aromatic materials, and are ignorant of the extent of damage our purchases can cost the environment. For this reason we have not yet demanded a change. At this time, in our western democracies, we are able to address and limit wholesale environmental destruction perpetrated by huge corporations and governments, when we are aware of it. These scenarios are blatant, and difficult to ignore. We have our champions of industrial and governmental reform, but few in this “grey zone”. Due to the underground and hidden nature of small wildcrafting operations, the vast territory that is spread over the whole of the world, the lack of sourcing information from large companies, we are simply not aware of the local and cumulative global impact the many tens or hundreds of thousands of wildcrafters collectively have. Without education or direction, they too contribute to the slow decline of the worlds ecology. 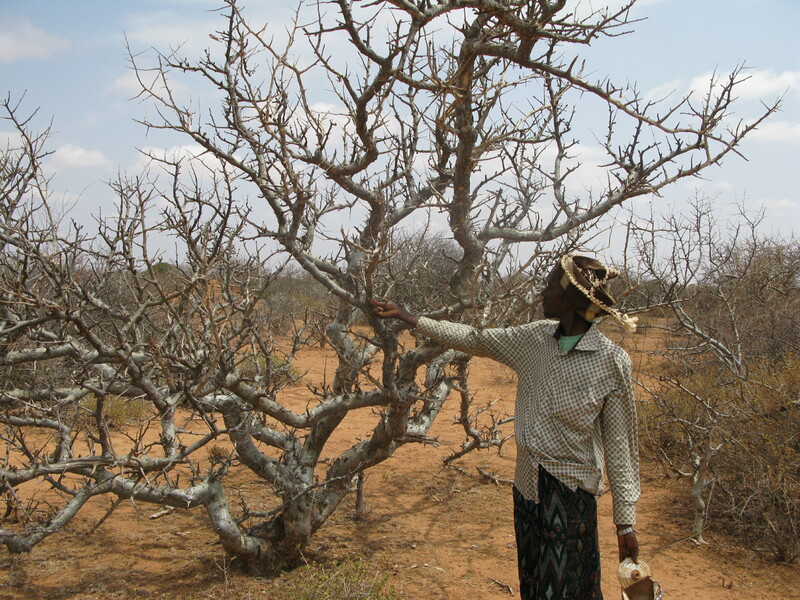 In the case of Frankincense trees, in some areas they are often already stressed by uncontrolled grazing, drought and long-term neglect and over harvesting. They are sometimes cut for lumber, cleared to make way for agriculture, used as a source of firewood in barren terrains, and when over or improperly harvested, decline in yield and often suffer from low seed viability which further adds to their decline in the landscape. I believe a study done on Boswellia Papyrifera showed a drop from 80% seed viability to 18% in trees that were stressed due to these factors, making it almost impossible for the trees to propagate themselves. Cooperatives on the other hand, encourage ownership and responsibility through reliable financial incentive, education, and when possible provide saplings and seedlings to restore the supply and increase the population. (As in the case of the Ethiopian government’s efforts to reduce the decline of Boswellia Papyrifera). Another benefit of managed wildcrafting, is that when present, middlemen, each profiting from reselling and sometimes adulterating the collected material are replaced by a “manager” who offers fair and consistent prices to the harvesters, sets standards of quality and purity, deals directly with the wholesaler/consumer. Purchasing through a co-op or other managed system of wild harvest and collection, the consumer benefits from the knowledge they will receive a product of consistent quality, they are not contributing to the extinction or over harvesting of natural resources, and they are supporting the small shareholders and collectors and their local economy. The consumer is assured that their financial choices are supporting ethics and methods that benefit nature, the ecology, local economies, and fair wages. It truly is s win win arrangement. Cooperatives and other informed management solutions can be part of governmental initiatives, local or international conservation organizations, local communities, groups, families or individuals. There are as many options for sustaining ecology and economy as there are ways to destroy them. Somaliland is in an odd position. Not yet acknowledged as an independent country by the UN, it strives for international recognition as a completely separate entity from war torn Somalia, to rule itself and build a stable, thriving economy. The collection and export of its oleoresins is a staple of the economy and the main source of income for generations of its citizens, one of many things that differentiate Somaliland from its neighbor Somalia. This is, in my opinion, also a cause worth supporting with our choices and dollars. There needs to be conscientious, responsible, sustainable and ethical wildcrafting in the world, and as this approach of managed wildcrafting spreads, I believe it could make a significant difference in our world, but only if we prove to the harvesters and co-ops it is worth their while financially, that we support what they are trying to accomplish by the simple act of choosing to purchase their products. We have to put our money where our ideology is. That’s where we come in. You and I. The choice of setting standards for ethical and sustainable harvesting of our worlds natural resources, is on our shoulders as the end users and consumers. Though we are thousands of miles away, and there seem to be cultural chasms between our worlds, the illusion of distance is evaporating through the rapid growth of the internet, global communication, commerce, immigration and travel. Our neighborhoods have expanded enormously. Frankincense, myrrh, sandalwood and other fragrant/medicinal trees and plants are actually in our backyards and every choice we make, or don’t make here, with our digital or physical “coin”, has a direct impact on the environment and inhabitants of every corner of our world. Human, animal, plant and mineral alike. Silence can be as damaging as action. The wellbeing of all the world and the nations around us, how other governments treat their citizens, each other, their women and children, their plants, animals, minerals, and ecologies, are all well within the influence of the ripples we make with our choices here in north America. Financial and other. Our choices are our voices. We underestimate the power we truly have. Poor as we may see ourselves in relation to our local societal and economical standards, you and I are the rich kids in the world, we live on the good side of the global “tracks”, and all it takes is 5 minutes on the streets of Cairo, Addis Ababa, Nairobi, Delhi or any of a thousand other cities to see this clearly. We are privileged and powerful in this world. We can make a real difference. Every single one of us, bar none, has the power to change the world for the better, one small choice and purchase at a time by using the collective purchasing power we have as consumers. Even those of us on welfare, disability and pensions are rich compared to the average citizen of most developing countries.We can make a difference in the world by directing our individual, informed, conscientious voices, and collective individual purchases towards a powerful cause and a clear statement. What kind of world do we want to see? Let’s choose. Let’s make it so. Through us, our governments have the clout to nonviolently, pressure foreign government bullies, to humanize their laws, end wars, protect women, children and the innocent. We have seen that using the power of the internet, a cohesive collection of individual voices can create powerful petitions that often change the tide of political, environmental, and economical decisions in “distant” countries. Our collective purchasing power is enormous, though while it remains unrecognized by us, it is latent and ineffective. Using our collective, individual small purchases to voice our noncompliance with unethical and unsustainable collection practices from the wild, we have the clout and power of a substantially large democracy. Perhaps more so than our governments which have many political considerations and toes to not step on. We really do, collectively have enormous, world changing power in our hands, just waiting to coalesce. Cooperative collected Somaliland B. Carterii 2013 Harvest. Bringing this cooperative harvested Boswellia Carterii oleoresin with me on my trip, I have had over a week to judge its quality. I am very very impressed. Not only is it fresh as stated and richly fragrant, even through the thick plastic bag, this Frankincense showed its true freshness by immediately softening and sticking between my fingers with the warmth of my body releasing its essential oils. This usually indicates a high ratio of fragrant oleoresins to water soluble gums. 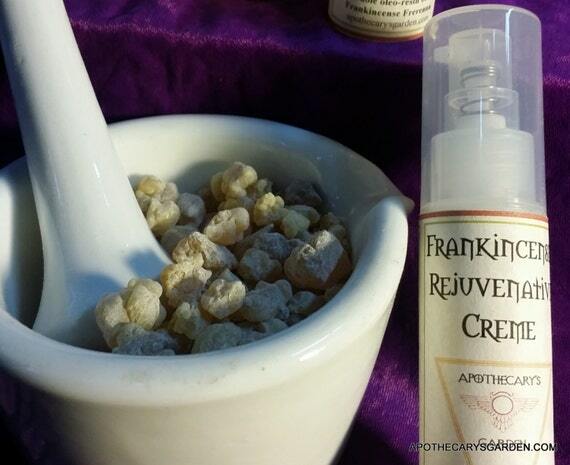 Often, as frankincense ages, it slowly loses its essential oils, becomes more brittle, powders more easily and oxidizes a bit. This batch is exactly as promised, freshly harvested, strongly fragrant and a versatile product for the consumer. Its fragrance, fresh, and burned is comparable to the best B. Sacra/Carterii I have so far examined. Having this opportunity to purchase directly from a Frankincense co-op, is a unique and exiting opportunity. Our purchases contribute directly to the well-being of the plants and the local environment, assure a fair price and wage to the collectors, support families and communities that live in remote inaccessible areas, and eliminate excess profiteering by middlemen. In this case, working through a co-op also supports the economy of a country struggling for recognition and independence. When we have figured out pricing and other details, I will post these wonderful Somaliland products in the store and let everyone know. The package I received also included samples of B. Carterii essential oil, and a beautiful perfume/medicinal grade essential oil of the local Myrrh. The Myrrh essential oil especially impressed me, and outshone even the Myrrh essential oil I found in Ethiopia last year. (Sorry Ermias!). Its colour is lighter than other essential oils of Myrrh, which adds to its usefulness in perfumery, and its aroma is heavenly. Softly penetrating with rich deep notes of balsam, vanilla, and a hints of wood and bitter green. However the loveliest characteristic of this Myrrh essential oil, is a subtle and unexpected floral note delicately woven through it. 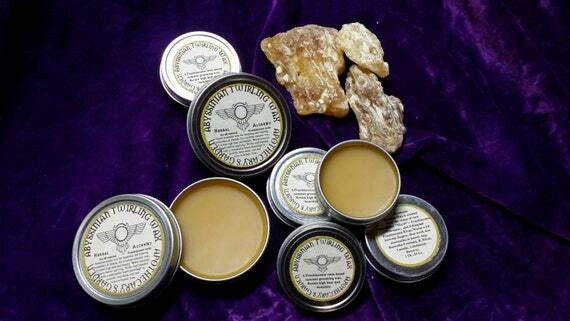 Purchase and import details of this high quality Myrrh and Frankincense essential oils is being negotiated as I write. As soon as these oleoresins and essential oils become available for purchase, I will let you all know. Somaliland is also home to the famous, rare and hard to get “Maidi”, or Frankincense Frereana. It has been transplanted and cultivated to some degree in Yemen, but its true home is in the mountains of northern Somaliland. This is the famous “Yemenite chewing gum” I often refer to here. It is still imported by Yemen and Oman from Somaliland, though often marketed as a local product. It was not included in this shipment, but my fingers are crossed that this cooperative will be able to share some with us, or at least direct me to a co-op that does. I will keep you all updated as this unfolds. The possibility of importing fresh, ethically and sustainably harvested Myrrh, Frankincense and Boswellia Frereana directly from the co-ops, is a very exiting project! Take some time to research Somaliland. Next time you consider purchasing raw oleoresins, essential oils or herbs, find out where they come from, when and how they were harvested. We demanded “Organic” from our suppliers, and now we have organic options. We have organic produce only because we asked for it and were willing to pay for it. This is only a first step, now we know that just because something is designated organic may mean it is better for us, but does not mean it is better for the planet. In fact the term “Organic” does not and never will be a standard we can apply to wild harvested plant material. We need to demand ethics and sustainability of harvesting wild material. This is the standard we need to establish and demand from our suppliers. Organic is simply not a qualification that can in any way be awarded to, or associated with, wild harvested products. We need to establish a new model, standard and qualification “Ethically and sustainably Harvested”. Look for cooperatives, outstanding individuals, people that care deeply or have a strong connection to the land. Look for ethical and sustainable collection methods, managed harvesting in some form. The more we ask for ethical and sustainable wildcrafted products, communicate this with our money, the more the market will recognize them as important to sales and profit margin, and will adapt to accommodate our needs around ethics and sustainability. Money does indeed talk, and when directed properly, it can cause a lot of good in the world. I don’t think we should wait for this to just happen on its own. I’m serious about creating a list on this blog of verified ethical wildcrafters and wild harvested suppliers, managers, and cooperatives with standards that are both ethical and sustainable. Please do post your suggestions in the comment section or email me directly at-dnriegler@gmail.com. If you know of any individual, group or company that fits the above criteria in your opinion, please let me know. Any suggestions, comments and opinions are welcome.